While the traditional camera market is in freefall, the best instant cameras are selling like gangbusters – so much so that Canon recently entered the fray with its new Canon Ivy / Cliq offerings. Now the reigning champion, Fujifilm, is returning fire with the instax mini LiPlay – the smallest instax product on the market. The LiPlay (which also bears the designation "instax mini HM1") had its user manual leaked by Nokishita, which was quickly picked up by sites like Fuji Rumors. 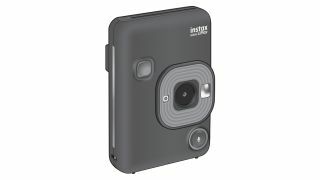 It's a hybrid instant camera with printing capabilities, and it also boasts a number of other interesting features. You use the rear LCD screen to frame and take photos, which essentially gives the camera live view functionality. These images can then be saved to the internal camera memory (currently unspecified) or to a microSD card. Photographs that you've taken – or, indeed, imported – can be selected from your library and printed on the LiPlay using packs of instax mini instant film. However, the most fascinating feature is the ability to record audio with your images via the dedicated Sound button on the front of the camera. This audio clip is then converted to a QR code, which can be printed on your photo. When this code is scanned using the LiPlay smartphone app, the audio is played. This is a great idea and one that we can see being hugely popular with the younger generation, as a fun way to send messages and share memories. The app also facilitates remote camera control, which enables you to use your smartphone to shoot images, and can transfer images from your smartphone to the LiPlay for direct printing (with the ability to make minor scaling and rotation edits before sending). The camera also features three shortcut buttons positioned on its left edge, which enable you to select different frames for your images. The app's final trick is that it can assign your own templates to these shortcuts instead. In all, it's a fun and highly innovative instant camera that we can see a lot of potential for – the QR code audio could really take off as a kind of analog Snapchat. Price will, of course, be key, so we will update with RRPs and release dates when we have them. What type of instant film do I need?